We first prepared this dish at my sister´s place. Initially I had wanted to make an oven-baked vegetable & chicken couscous, she suggested to use the jerk spice mixture and it was an absolute winner. Today we celebrated Simon´s second birthday and I prepared this again. 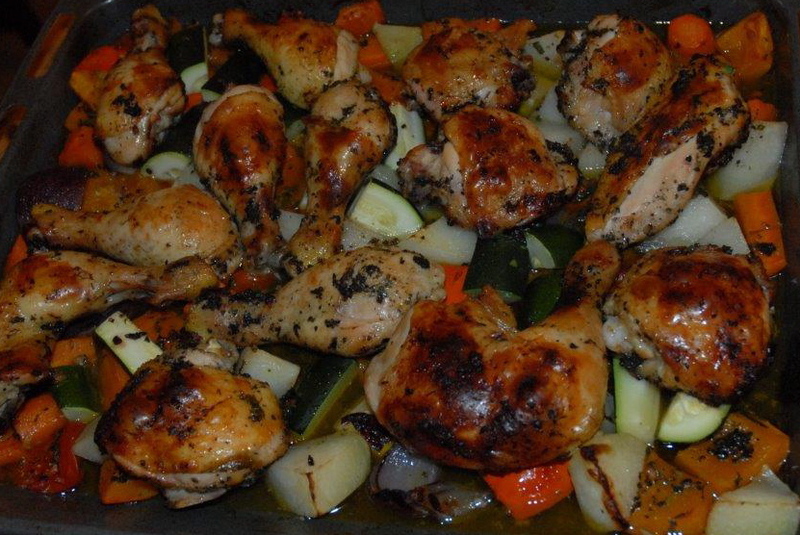 It´s so amazingly easy as you just marinate the chicken overnight (make sure you start the day before), then peel and cut the vegetables into chunks, assemble all onto a baking tray, and chuck it into the oven. The recipe for the jerk spice mix is from Jamie Oliver´s website: Levi Roots – style jerk chicken. Pound the allspice and the black pepper in a pestle and mortar, then mix in the sugar and honey. Add the herbs, the ginger, garlic, chili (if using) and salt and pound a little more. Add some vegetable oil. Add the marinade to the chicken and rub in well, then leave in the fridge overnight. Preheat the oven to 180°C (fan).Scatter the vegetables (except the courgette) onto a baking tray, add the chopped parsley and coriander as well as some vegetable oil and some salt. Mix with your hands then distribute on the tray. Pour in a glass or two of water. Place the chicken, skin side down, onto the vegetables. Bake in the oven for 30 min. Then take out, tuck the courgettes under the chicken, then turn the chicken skin-side up. Bake for another 20min. Finish under the grill for two minutes or until the skin is nicely browned.